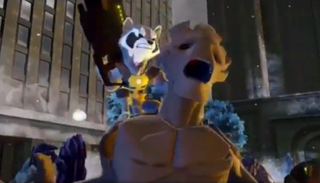 Marvel and Disney have just revealed that the next edition of their ridiculously popular toy-stroke-video game initiative Disney Infinity is getting a new super powered version, adding a roster of Marvel characters to the game. I'm not really into the whole Skylanders-esque stuff, but goddamn, I will get those ADORABLE Rocket and Groot figures if they look that good in the flesh. The Avengers figures are pretty neat! Kotaku has more details below.